We can help you modify your existing rifle or design and build you a new custom rifle. I specialize in custom loading for long-range rifles. 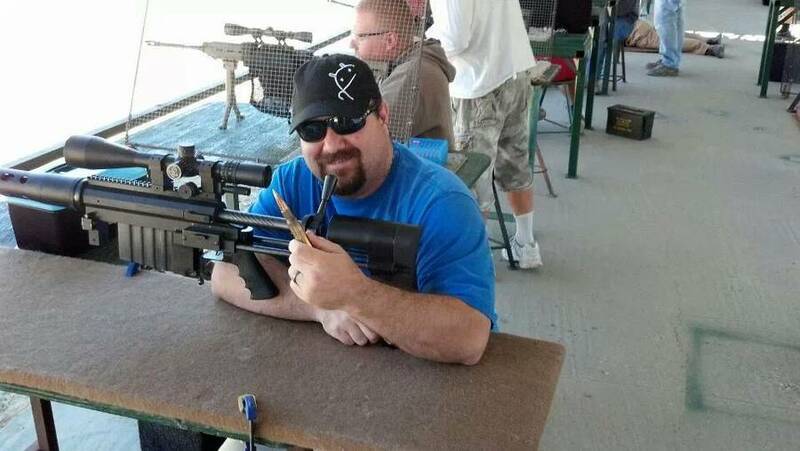 Bill's Brother-in-Law, Robert, shooting an EDM rifle calibrated in 50 DTC. West Thompson Shooting Range in Fillmore, CA. Dzuro's Guns and Accessories (Ventura, CA) is not just your standard gun shop. We offer custom rifles and custom loading in addition to standard factory firearms. Everything from mild to wild. I first came to appreciate firearms when my father took me out shooting when I was 13 years old. We went to the police range and I shot a .22 rifle and .357 revolver. After that I was pretty much hooked. My first gun was a Baretta 92 FS. I got it when I turned 21, and my second was a Sig Sauer 229 in .40 S&W. When I was in my mid twenties I got into custom loading, because there wasn't anything out there that my rifle liked. I started of with single-stage presses, and from that point it just escalated to loading for everybody else I knew. About four years ago I had a lot of friends who were starting to tell me I should open my own business because they would rather buy guns and ammunition from me than anybody else. After many nights of contemplation, I decided I wanted to start something that would allow me to give to people what other gun shops couldn't. I wanted to start a business that would be far apart from others. Owning a custom cabinets shop, Dzuro's Custom Cabinets, for 20 years has taught me a lot about customer service. Anybody can build a cabinet, but not everybody can give customer service. I've taken the knowledge and experience that I've gained from the many years of my first business and put it into a gun company. I believe customer service should always be #1. Customer service and quality should go hand in hand. I can get anything for anybody, but the one thing I can do better than anyone else is help suit the unique needs of each customer. I always enjoy taking people out shooting for their first time. I like to be the first one to teach them how to shoot. That's because I want to help them learn the correct way of handling a firearm, and at the same time, I hope to show them how to actually appreciate the kind of sport this is. I feel that if I can make it a positive experience, they will always associate firearms with that positive experience. So, instead of associating the sport with the negative aspects that you hear about on the news, they understand what responsible gun ownership is, and they know what kind of fun they can really have.